Githeri is an indigenous Kenyan meal made simply by basically stewing a combination of beans and maize seed(corn). It is mostly associated with school life especially for those who attended boarding schools. The meal originally from the Kikuyu tribe has become popular in modern times with different variations of the ingredients. The combination of beans and corn supplies a full complement of protein for the often protein-poor diet of many Kenyans. For many people the mention of githeri brings to mind some lacklustre meal hardly fit to be cooked for that real important guest, but this spicy sweat corn githeri twist is about to take your ordinary Githeri to a whole new level.As usual i belong to the school of thought that believes in cooking without a strict set of guidelines(a.k.a Recipe). A good chef cooks as he goes,adjusting the ingredients to best suit his or her audience, therefore adapt this recipe to fit your tests, but more than anything get to understand the technique,that's what 'often' distinguishes a home cook from a professional chef.Let me now stimulate your taste buds with my version of sweet corn githeri! Sweet Corn, cut fresh off the cob 3 to 4 ears, or a can of your preferred sweetcorn brand from your local grocery store/supermarket! In a large pot with enough water just to cover, boil the Mexican beans. Season with salt and pepper and bring to a boil over medium heat. Reduce heat to low and simmer until cooked through, 8 to 10 minutes. In a different pot with enough water just to cover, simmer the sweet corn for 5 min. Season with sugar. 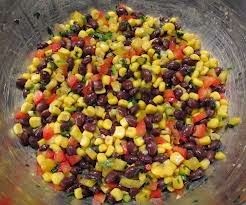 Drain the excess water on both the beans and sweet corn and mix them together. Braise the meat on low heat and add to the onions, garlic and carrots stir and let it simmer for 5 minutes. Add the tomato paste and the finely chopped tomatoes, stir for 2 mins on low heat then add the beans and sweet corn mixture. Keep stirring. Add salt to taste, add a little water. Let it simmer under low heat for about 10-15 minutes. When ready, add the chopped cilantro and let the Githeri sit for five minutes, then serve with steamed cabbages or other vegetables.